Editor's note: This is number 17 in a series of posts by Dennis Horne, sharing quotes from his book, Determining Doctrine: A Reference Guide for Evaluating Doctrinal Truth. You can read the introductory post here. The first part of each post is a new introduction, placing the quotes in context with contemporary issues. The quotes that then follow are from the Determining Doctrine book, which contains many quotes that are not readily available elsewhere or are exclusive to the book. So the women (and men) involved in any of these extremist movements have the constitutional right to be false leaders and teachers and to agitate for false or foolish causes. The Salt Lake newspaper, as annoying as it sometimes is, also has the right to cover (really promote) false prophets, deceitful voices, and activist/extremist causes and support the agendas of deceivers and excommunicants. We feel special concern, however, for members who distance themselves from Church doctrine or practice and, by advocacy, encourage others to follow them. Recent symposia sponsored and attended by some members of The Church of Jesus Christ of Latter-day Saints have included some presentations relating to the House of the Lord, the holy temples, that are offensive. We deplore the bad taste and insensitivity of these public discussions of things we hold sacred. We are especially saddened at the participation of our own members, especially those who hold Church or other positions that give them stature among Latter-day Saints and who have allowed their stature to be used to promote such presentations. We have a different concern about some of the other topics at these symposia. Some of the presentations by persons whom we believe to be faithful members of the Church have included matters that were seized upon and publicized in such a way as to injure the Church or its members or to jeopardize the effectiveness or safety of our missionaries. We appreciate the search for knowledge and the discussion of gospel subjects. However, we believe that Latter-day Saints who are committed to the mission of their Church and the well-being of their fellow members will strive to be sensitive to those matters that are more appropriate for private conferring and correction than for public debate. Jesus taught that when a person has trespassed against us, we should “go and tell him his fault between thee and him alone,” and if he will “neglect to hear” this private communication we should tell it unto the church.” (Matthew 18:15, 17.) Modern revelation tells us that this last step “shall be done in a meeting, and that not before the world” (D&C 42:99). There are times when public discussion of sacred or personal matters is inappropriate. The following is the complete transcript of the First Presidency’s statement on scriptural mandate as reason for the LDS Church’s Strengthening Church Members Committee. The Strengthening Church Members Committee was appointed by the First Presidency to help fulfill this need and to comply with the cited section of the Doctrine and Covenants. This committee serves as a resource to priesthood leaders throughout the world who may desire assistance on a wide variety of topics. It is a General Authority committee, currently comprised of Elder James E. Faust and Elder Russell M. Nelson of the Quorum of the Twelve Apostles. They work through established priesthood channels and neither impose nor direct Church disciplinary action. In light of extensive publicity given to six recent Church disciplinary councils in Utah, we believe it helpful to reaffirm the position of the First Presidency and the Quorum of the Twelve Apostles. We deeply regret the loss of Church membership on the part of anyone. The attendant consequences felt over time by the individuals and their families are very real. In their leadership responsibilities, local Church officers may seek clarification and other guidance from General Authorities of the Church. General Authorities have an obligation to teach principles and policies and to provide information that may be helpful in counseling members for whom local leaders are responsible. In matters of Church discipline, the General Authorities do not direct the decisions of local disciplinary councils. Furthermore, the right of appeal is open to anyone who feels he or she has been unfairly treated by a disciplinary council. We have the responsibility to preserve the doctrinal purity of the Church. We are united in this objective. 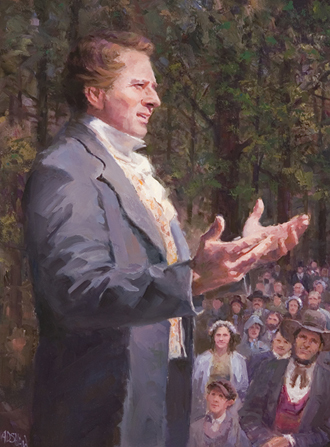 The Prophet Joseph Smith taught an eternal principle when he explained: “That man who rises up to condemn others, finding fault with the Church, saying that they are out of the way, while he himself is righteous, then know assuredly, that that man is in the high road to apostasy.” (Teachings of the Prophet Joseph Smith, p. 156.) In instructing His Twelve Disciples in the new world about those who would not repent, the Savior said, “But if he repent not he shall not be numbered among my people, that he may not destroy my people….” (3 Nephi 18:31, see also Mosiah 26:36 and Alma 5:59.) The Prophet also remarked that “from apostates the faithful have received the severest persecutions.” (Teachings of the Prophet Joseph Smith, p. 67.) This continues to be the case today. The First Presidency and the Council of the Twelve issued the above statement Oct. 17 in response to widespread media coverage of events surrounding five Church members who were excommunicated and another who was disfellowshipped in September following separate disciplinary councils in their stakes. All six were residing in Utah at the time the councils were held. Other alternate voices are pursuing selfish personal interests, such as property, pride, prominence, or power. Other voices are the bleatings of lost souls who cannot hear the voice of the Shepherd and trot about trying to find their way without his guidance. Some of these voices call out guidance for others—the lost leading the lost. And four of them were the sons of Mosiah; and their names were Ammon, and Aaron, and Omner, and Himni; these were the names of the sons of Mosiah. And thus they were instruments in the hands of God in bringing many to the knowledge of the truth, yea, to the knowledge of their Redeemer. There are Church watchers, in and out of the Church, who show great interest in what we do. They watch what they define as the power structure, the resources of the Church, the changes in organization, the political and social issues; and they draw conclusions from their watching. They write their observations and print them in publications and represent them to be accurate and objective reports of what is going on in the Church. In all of their watching and claiming, they have missed the most important of all the things that we have done in recent generations. Some of them say that we have lost our way, that we are not Christians. Should they turn to that one thing in which they show the least interest and in which they have the least knowledge, the scriptures and the revelations, they would find in the Topical Guide fifty-eight categories of information about Jesus Christ; eighteen pages of small print, single-spaced, list literally thousands of scriptural references on the subject. These are some chilling quotes. Fully active member with solid testimony here...I think you are on to something here. "But having allowed for that as the Prophet did, such certainly does not mean that we must listen to or support or follow them to hell." Really? When I was baptised the missionaries told me about the 3 kingdoms of glory. They never mentioned a special "hell" for those that left the Church. If anything it sounds more like the terrestrial kingdom (being fooled by the craftiness of man). It is blatant bias writing like this that contributes to the hard feelings of those that leave the church. Such a shame. "We feel special concern, however, for members who distance themselves from Church doctrine or practice and, by advocacy, encourage others to follow them." Sure doesn't seem like it from your previous words. Dissidents and apostates are not my intended audience and I am not seeking to persuade them; they are fairly un-persuadable. The missionaries that taught you only gave you the basics, not every doctrine of the church; read section 138 and Alma 28, 34, 40 and 42 and you will find that hell is in the Spirit World and that is the state of the rebellious and those who follow the rebellious. People who leave the church have done so because of hard feelings, because the wicked take the truth to be hard. If a member pulls a John Dehlin or Kate Kelly or Jeremy Runnells or whatever, they will ignore these quotes and lose the blessings and go to hell at their death, which is a place in the spirit world prepared for them and those of like mind. Meanwhile, maybe someone else who is struggling but hasn't lost their grip on the iron rod will read the quotes and clamp his hand to the rod and ignore the fingers of scorn and stay out of the river and mists of darkness; these are they who are worth helping; I hope they see these quotes. Just read 138...no mention of sending people to "Hell," just spirit prison. Only time it uses the word hell was rejoicing that the atonement saved them from the "chains of hell." It also had people teaching in spirit prison trying to help those that fought against the prophet. I guess they don't share your views that only those going to spirit paradise are "...they who are worth helping." None of the quotes you have above say the word Hell. I wonder why we don't use that word in the way that you are using it? Is it maybe because our church doesn't run on fear but testimony? When you word a point like you did above it spews ignorance and bias. As a church we stand steady in our doctrine and beliefs while separating behavior from the person. We don't hate sinners but we don't tolerate sin. Your thoughts that you shared both in the comments and the article reflect your negative feelings toward people and you judge their worth. If my son ever left the church I would love him just the same and hope that no one would say that he is not worth helping. Maybe there are some more doctrines about the worth of souls and the power of the atonement that could help this article be better. How someone could read section 138 and those chapters of Alma and miss the doctrine therein of the fate of the unrepentant rebellious is beyond me and shows a willful blindness and desire for the scriptures not to mean what they say. Did you not read about the doctrine of restoration that the rebellious apostate here will remain a rebellious apostate there? It is all laid out by Alma and by Joseph F. Smith so that a child could understand it. Spirit Prison and hell are the same place. If you think it empty of those who rejected the words of the prophets in this life than I don't know what to say. We must work out our own salvation with fear and trembling before God. If you cannot understand this scripture, then I can do no more (Alma talking): "Yea, and I had murdered many of his children, or rather led them away unto destruction; yea, and in fine so great had been my iniquities, that the very thought of coming into the presence of my God did rack my soul with inexpressible horror" (Alma 36:14). Here leading people away from the gospel/church is likened unto murder!, the destruction of their souls. That is what the people I have named are actively doing with all their hears; leading people to destruction, to hell, to spirit prison. The knowledge that he had done so caused Alma's soul to be racked with inexpressible horror. He was racked with these "exquisite" pains for three days before he thought to repent. So I say again, these people have a constitutional right to go to hell and lead others there, but we need not follow them there. "repent, lest I smite you by the rod of my mouth, and by my wrath, and by my anger, and your sufferings be sore—how sore you know not, how exquisite you know not, yea, how hard to bear you know not" (D&C 19:15). Both the Lord and Alma use the word "exquisite" along with other very strong terms--what more need they say? Apostates are currently leading people to hell and people are currently following them there. Another one just announced his intentions to go their loudly in the Salt Lake Tribune yesterday. Disbelief in the afterlife will save no one from eventually going there and dealing with not only the fate of the punishment of their own souls, but also the knowledge that they led others there, figuratively murdering their souls. Fear of such ought to cause their body and soul to quake before God. For in the end, "after they have paid the penalty of their transgressions, and are washed clean, shall receive a reward according to their works, for they are heirs of salvation." (138:59) This "salvation" is NOT exaltation; is is salvation in the Telestial or Terrestrial kingdoms for those who filled the requirements for such as laid out in section 76 and 88. Now, I for one will admit to negative feelings towards John Dehlin and these others that figuratively murder the souls of others and encourage people to let go of the iron rod and get lost in mists of darkness. Maybe I could do better, but at least I know what the scriptures teach on these eternally serious matters and I hope those quotes help those whose hearts are net yet too hard to avoid that fate. My anonymous quote was deleted, so I'll go ahead and be brave enough to post my real name this time. I would like to encourage you to really rethink the introduction to this article if you truly intend to address it to dissidents and apostates. There are many degrees of dissent, and engaging in hostile rhetoric will only serve to drive people away from the messages of the leaders, rather than draw them to them. Invite the dissidents to read the words of the prophets rather than criticizing their media choices and condemning them the hell, and I think your intended audience might be a bit more receptive to the words of the leaders, which are certainly in a softer tone than the introduction. Emulate your leaders and you may be able to engage dissidents in a civil discussion instead of driving them further from the Gospel. I assume you are the same guy as above. Again, I don't address dissidents and apostates--although Church leaders do in a way because their counsel is for the public, and no, it is not really that gentle. All degrees of dissent keep one from celestial glory, which only the valiant in the testimony of Jesus receive (see section 76). I condemn no one to hell but I would have to be blind and deaf not to see where they are sending themselves and where I do not want to follow. You might want to do a little homework on the tone of church leaders. While the current PR office and some of the present leaders have used a soft tone, others, especially their predecessors, have not. Prophets and apostles like Brigham Young, George Q. Cannon, Joseph F. Smith, Joseph Fielding Smith, Bruce R. McConkie, Spencer W. Kimball, Mark E. Petersen, Jeffrey R. Holland, etc., were more vigorous in their denunciations of apostasy and the fate of apostates. Read your D&C and find out what the Lord himself says about being turned over to the buffetings of Satan. Read section 19 about the suffering of the wicked and rebellious who will not repent. Apostasy may be an intellectual game or exercise for some in this life, but in the next it will be a different story. No excuse will work at the judgment. But you are entirely welcome to your views and I thank you for commenting. I apologize. I suppose I was confused by your headline - "Church Leaders' Counsel for Dissidents and Apostates"... I thought you were talking to dissidents and apostates. I'm sorry I made such an obvious mistake.